DETROIT — Talk about pressure. Just a couple of weeks before General Motors has to submit a detailed plan proving viability, GM executives have no idea what to do with their losing brands. With President Barack Obama still selecting his team of advisers, it's a bit fuzzy as to how specific GM will have to be about its plans for Saturn, Saab and Hummer. But at this point company leaders are stumped for solutions, sources say. They say GM has had little success shopping the brands to potential partners or outright buyers. Although GM is entertaining other options, there is a real possibility that the company will shut down those brands, even at the risk of costly dealer lawsuits. The future of Saturn, Saab and Hummer was thrown in doubt in December when the Bush administration granted GM a $13.4 billion loan. In turn, GM was asked to submit a detailed plan to the U.S. Department of the Treasury by Feb. 17 showing how it will become viable. To demonstrate its viability, GM must show that it is likely to achieve long-term profitability and has a positive net present value. That means a projected positive net cash flow, considering all liabilities. By March 31, Obama's designee must accept or reject the plan. If that plan is unacceptable, Obama could demand immediate repayment of the $13.4 billion loan. Those terms were set by the Bush administration, and Obama's team could revise the conditions. On Dec. 2, GM told Congress it will focus most of its resources on its "core brands" — Chevrolet, Cadillac, Buick and GMC. -- Saturn. GM asked various companies to run Saturn and absorb the dealerships, provide product lines and perhaps rename the brand, says a source. Under that scenario, GM no longer would own part of Saturn. But no one was interested. GM never tried to sell Saturn outright because it is so entrenched in GM's product and manufacturing system that it would be nearly impossible to reorganize as a separate company. Since Dec. 2, GM executives have discussed several options with Saturn dealers who are members of its Franchise Operations Team, says Mark LaNeve, GM North America vice president of vehicle sales, service and marketing. According to a dealer familiar with the talks, options include allowing dealers to buy the brand, blending Saturn into the Buick-Pontiac-GMC channel, finding an outside investor to finance an upgrade of the product lineup and finding a global partner. But Saturn's future remains unsettled, and GM could kill it, one source says. -- Saab. 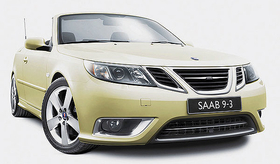 Several months ago, GM quietly started shopping Saab but found no buyers, say two sources familiar with the situation. There was one interested party last summer, one source says, but GM wasn't ready to sell Saab. Now GM hopes to make Saab an autonomous company, the source says. That means moving production, engineering and marketing to Sweden and pulling Saab out of GM's global product and manufacturing system. "We're trying to see how much of Saab we could isolate," the source says. The next step is to secure funding from the Swedish government to help Saab run on its own. Saab hopes to launch the next 9-5 large sedan and new 9-4X crossover next year. The Swedish government has offered aid but does not want an ownership stake. The third step, GM hopes, would be a successful launch of the new products, making Saab attractive to a partner or buyer. GM does not want to hold on to Saab. If the plan fails, GM would likely close it, sources say. -- Hummer. GM put Hummer on the block last summer and knowledgeable sources say there is an interested party. But sources close to GM say Hummer's financial situation will make a deal difficult. One source says it's hard to build a business case for the brand, especially in view of coming U.S. fuel-economy standards. And the current global economic slowdown makes it unlikely that international sales could rescue Hummer. GM is asking $500 million for Hummer but likely would settle for less, says a source close to the discussions. The bottom line: As with Saturn and Saab, it is possible that GM will simply shut Hummer down.